Ruby Hornet and Jugrnaut‘s Digital Freshness has hosted the likes of Action Bronson, Mr. Muthafuckin’ eXquire, Raekwon, The Cool Kids, Rockie Fresh, and more in the past. 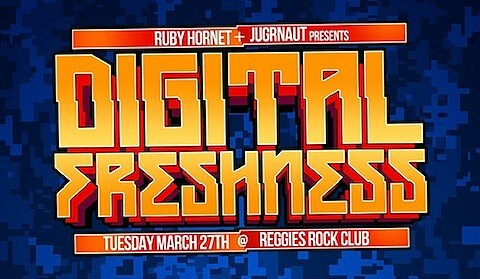 This coming Tuesday (March 27), Digital Freshness is back, this time at Reggie’s to present the bill of Caleb James, Chance The Rapper, Legit, Calez, St. Millie, and Kembe X. There will be a special beat set from Thelonious Martin and DJ sets from RTC, Manny Muscles, and Justin Pollard. Also, #RestInPizza because ShowYouSuck is hosting. Advance tickets for the show are on sale now. Song streams/videos from all, and a show flyer, below..